Today, two hundred years ago, Charles Darwin was born. Aged fifty he published ‘The Origin of Species’ where the science of fossils, and their detailed study, revealed evolutionary truth. On such anniversary I present to you a grass-roots Scottish contributor to Darwinism, who due to his own diffidence, has been completely overlooked by scholars. Dr Daniel Reid Rankin (1805 – 1882) of Carluke is of considerable fascination. Long dead, I first heard about him from my aunt, Ena Scott of Hill of Orchard, in the year short of her 99th birthday. Months after her death I was given an old copy of an unpublished family manuscript ‘A Clydesdale Man’ by Alec MacCallum-Scott M.P. (first biographer of Winston Churchill) a chapter of which was dedicated to the doctor, revealing the sort of marvellous eccentric that the world will no longer cradle. To Daniel Rankin, perhaps like no other, I have felt akin. Surprisingly (given my endless delving) our DNA has no mirror; though I comfort myself that we are both humble doctors of Scotland, separated a century apart; and in evolutionary terms that is surely but nought! Rankin, like me, had a fascination of all before, but brought such understanding, in a way that I never could. The admiration I have for Daniel Rankin lies peculiarly with his humility; he was a man truly honest to his principles, which then so unfashionable are now decidedly modern! The small thatched cottage of the Rankin family, at the corner of Market Place has long since been cleared, and the scene now requires much imagination; however some spirit of place seems to have lingered, for in its footprint, I have since discovered, sits the current health centre for Carluke! According to the doctor himself, the Rankins were descended from one of Rob Roy’s men; that surprises me not, for Rankin himself was both the outlaw and folk hero of Carluke and his presence imprinted – red hair, hat and athletic frame – on the collected consciousness of his villagers long after his death. His mother’s favourite, Daniel was marked out for his freedom of thought – always original and always perceptive; aged five, when his father asked him if he loved God, Daniel replied “No.” Hearing this his brothers and sisters, fearing an outburst of indignation, hardly dared to breathe. “Why not?” asked the father, “Because he burns folk” Daniel answered firmly. Daniel was fond of dancing, and after class he delighted his mother by skipping fantastic steps, with a narrative of their own, and he finished, to his mother’s applause, by standing on his head. Daniel never dared step his routine before his father (most stern), but understood that his mother was different, and that her love reached beyond his religious indiscipline. In years of manhood, Daniel never forgot the impish fun of turning auld Licht ‘wisdom’ upon its head. Daniel was not a boy burdened by the cause of establishment, and his dancing steps, like Billy Elliot took him on a journey through life in a cause that was to be the revelation of the homosapien epoch. Aged sixteen, Daniel attended Scots Law in the Andersonian University, but instinctively was drawn to the study of man, and so in 1824 he abandoned his post in the lawyer’s office and devoted his whole time to the study of medicine. He pursued his studies in Glasgow, being admitted a member of the Glasgow Medical Society and obtaining his degree (L.F.P.S.) in 1829. He was awarded a gold medal in one of his classes, but ‘never troubled’ to take possession of it. Victorian testimonials, certainly those that I have read in my research, often lack appraisal that feels genuine – yet for newly qualified Rankin, the disingenuous does not appear. Every testimonial that I have found for young Dr Rankin narrates his brilliance. Yet equally his weaknesses were not buried – and Rankin, for all his unquenched thirst for understanding, it was noted, vitally lacked ambition. His abhorrence of pomp, fancy and self-possession prevented such – and whilst principled he was never political. He would not change his stance: he would stand on his head. Rankin was torn; his talent recognised yes, but his trait was pure maverick – he hated limelight and despised the absurdities that he found within the academic world. For a time during his college career he acted as assistant to Robert Hunter, but on one occasion, the professor being absent, Rankin was asked to lecture in his place. This prospect so excited him that it brought on a haemorrhage, and he collapsed in the street. Passers-by identified him from a letter found in his pocket, and had him taken home. My sense of all this, and further writings made around this time, is that Rankin though clearly brilliant, was awkward in company, and had an unease beyond the general. His idiosyncrasies I am certain were borne of such. So when Dr Cullen departed for Rio leaving an opening at Carluke, Rankin took over the practice, settled down in his native village, and in spite of the protestations of his scientific friends, remained there for the rest of his life. From the moment Aunt Ena first described Rankin I was fascinated; but especially with the recollection of the doctor ‘that in his lifetime he had been three times in the fashion.’ The wheel of fashion had, he said, ‘twice come round full circle.’ He was a tall, handsome man, who dressed in tight-fitting surtout coat with flowing skirt, tight knee breeches, hessian boots, and a tall silk hat. 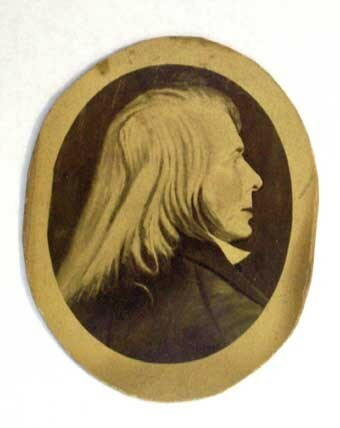 A conspicuous part of the picture was his long hair of reddish yellow, which flowed in straight lines to the shoulder. In his early days it stuck out in a sort of wave over the neck; and after removing his hat, he used to run his fingers through his “mane.” On wet days it was always tied at the end and tucked away under his hat. He was a grand rider, and he was always seen mounted on a famous black horse that no one else could manage, and not infrequently the doctor would arrive on a house-call by jumping his horse clear over the wall into the garden only to leave in the same way! Later, as an old man, he covered the miles of his broad practice on foot, walking lightly and gracefully even in infirmity. Dr Rankin recorded himself that he never once used the train. Rankin never knocked at a house door but walked right in like a member of the family. If there was no one at home he would take all the chairs in the sitting room and arrange them in the middle of the floor. Next, time he met he would say: “I called the other day but there was no one at home so I just left my card.” This reminds me somewhat of my grandfather Rab Scott – of the family of Jelly-makers. During the war, he would invite friends around to dinner at Drumdruills, as night fell, he would make some excuse, nip outside, and wedge sandbags under the car wheels. As he bade his guests farewell he would laugh as their cars revved hopelessly without an inch of propulsion. My grandfather had legendary tom-foolery and given the ways of Rankin before him, I find myself wondering if this is a trait spawned of this Clydesdale reach? These were the days of heavy drinking, and Rankin disapproved strongly. He loathed the disgusting sight of humanity huddled in helpless confusion and never partook, not even as a student. From the first Dr Rankin was singularly careless about money. To the poor he gave his services without fee, and even those in more favoured circumstances often failed to persuade to accept payment. “I’ll tell you when I need the money.” Certainly I know, that with my family at Gowanglen, of Orchard, he simply ordered a basket of fruit for his services or asked for it to be delivered to some poor patient. With the Landed families he still often left the matter to kindness, and he was particularly lax in preparing bills. To one wealthy lady, whom he had attended day and night for months, he sent a brief account with a sum rounded short (and to his cost): “To Medical Attendance, £10.” She returned the bill and asked for his services to be delineated. Dr Rankin wrote out a long list of details but sent in a bill for double the amount. She paid the bill, but he would never attend her again. ‘I don’t like it,’ said the Doctor shaking his head, ‘but give me a bit o’ paper and I’ll write ye out a prescription. There, get a pennyworth o’ that and I think it’ll cure ye!”…. In another case his patient was convalescent after a long illness and he complimented her on her pluck and endurance. ‘What will be the best thing for me to eat, now that I’m getting better?’ she asked. ‘You might try a dish of horse-shoe nails fried in butter!’ was his reply. It was his way of intimating that he regarded the recovery as complete. In talking to children he had a curious fanciful way of speaking, which appealed to their imaginations. A little girl, happening to see in the doctor’s house an anatomical specimen, asked to have it. “We’ll see,” he said; “bring a great lapful of cabbages on Sunday to feed it.” Then he warned his servant to receive the cabbages with due solemnity when they came; it was wrong, he said, to disappoint a child. It is sad that so very few copies of Dr Rankin’s only book exist – his chronicle of Carluke and parish back to the 13th century. The title he chose for his ‘history’ was awkwardly cumbersome, and I think, unrepresentative of the man, and reminds me always of my days as an Arts Graduate in Edinburgh when the first reading of my dissertation was debunked for similar reason. Then I returned to poetry and in such ground brought about a draft that ultimately was awarded distinction. I guess, the Rankin that I think I have come to know, should have given some sway in his historical notices to the charm of tradition and rhyme, a field in which he was well blessed. Indeed many of the traditional rhymes recorded by Robert Chambers for our nation actually came from Carluke and survived only because of our good doctor! As a doctor, sometimes I believe we live in the myth that all that is modern is better. Certainly it is true that through the continuing advances of medicine we are more healthy and living longer lives. Advancement is a cause that we should all be proud. Yet (and perhaps I am wrong here) the care of the hospitalised is more depersonalised than ever. Gone are the days when the doctors and nurses were continuous in care – today we are all on shifts. Of course we are better than ever at recording biological parameters and in saving lives, but perhaps (I may suggest) we forget the life behind the ‘patient.’ Everyone of us, bar exceptional cases, will be a ‘patient.’ You may ask where I am going with all this; well having recently transcribed letters to my family from Florence Nightingale, I feel well placed to place Dr Rankin in a perspective both historical, and perhaps more meaningfully in context of the care of today. It is my belief that Rankin was unique in his time. His care of his parish had an over-arching reach that encompassed both scientific and personal. Today care rests on the former and there is neither time, nor interest, in the latter. I would suggest that this is a cost and a step backwards in care. Dr Rankin would of course stand on his head! Broad shoulders – large body – short arms – shorter legs-a considerable head: mostly face, set on shoulders, with the neck a-wanting. That face, red, fleshy and unsmooth, was furnished with a mouth ample and, it may be, suitable; a nose warty and rosy which all but wagged on gravitation principles; ears laid on a cushion of puffy buff-leather-looking material, making an unseemly claim to be part of that already big bare red face; a brow overlaid, as if for protection, by strong whitish hairs smooth as comb could make them; eyes, firm, restless, well-set, and bespeaking intelligence, which added greatly to humanize, nay ornament, a face that needed some such modifying power; and behind all, a strong head of hair, white with a decided tinge of unpleasant yellow, combed so much forward, so much downwards towards the ears, so much backward, which last disposition of the hair necessarily overhung the coat neck. What a study! I do hope, that from what you have read so far of Daniel Rankin, you may agree with the good folk of Carluke, that in their doctor they not only had of the country’s great eccentrics, but also a man most selfless, who never waivered from his principles. For my own part, as a doctor of the 21st century it is surely rather wonderful that a man whose fashion, was said to have come and gone three times, had the foresight of preventative medicine. This I feel, has been overlooked. However, you will recall that I started out in this article, imperfect as it is, by placing Daniel Rankin amidst the quest and cause, that is now understood in one word; Darwinism. On the death of Rankin in March 1882, Dr Hunter Selkirk printed an obituary concluding that “There is no question that his name will go down to posterity as one of the most faithful students that Scottish Geology has ever possessed.” Alas, I feel this has not been assured for reasons I suspect simple. Firstly, Daniel Rankin had no family to prosper his cause after death; secondly, and perhaps more decisive, in his testamentary instructions Dr Rankin asked that his life should not be recorded or celebrated in any way. Rankin thought that wasteful of the living. “I am a most impatient reader,” he once wrote to Professor Allen Thomson, the celebrated Anatomist. “I have no toleration for anything but the old book of Nature.” Nothing in nature failed to interest Rankin, and he was certainly not fossilised in the study of the dead – life in all forms being truly wondrous to him and as he went his rounds through the country; birds, beasts and insects came under his acutely observant eye; their habits were studied day by day until their life histories familiar. The doctor was lucky in that his reach of the Clyde had many attractive features for the geologist; with rocks formed in the carboniferous prised into visible strata. It is not hard to picture then the young doctor, hammer in hand, wandering among the ‘gills’ and quarries of his parish alone or accompanied by members of the Useful Knowledge Society, studying the records of the ancient history of the globe. The doctor’s collection of fossils, in the time of which I speak (the early 1840’s) became the breathless and excited whispers of the scientists and geologists of the day, including Charles Darwin. At the 1840 meeting of the British Association of Geologists, the President remarked: ‘This collection owed its chief riches to Dr Rankin of Carluke; who not only laboured for us gratuitously, but lent his own unrivalled museum of ichthyolites in which eyen Agassiz found novelty.’ Louis Agassiz borrowed some thirty specimens from Rankin and had them sent to London to be sketched by Joseph Dinkel. ‘Your specimens are new to all’ he replied by grateful letter to the doctor. One of the genera he named after the doctor – Gyrolepis Rankinii. Many reading this will have passed through Carstairs Junction, and might forgive my inglorious suggestion that not much has changed! Not many places could impale an explorer intrepid like the Bulldog! You are likely aware that Huxley was best known for championing Darwin’s Theory of Evolution of Natural Selection. In a celebrated exchange at the British Association in 1860, Huxley and the Bishop of Oxford, Samuel Wilberforce, clashed; with Huxley declaring he would rather be descended from an ape than a bishop! You can be assured; the news of this exchange would have reached the cottage on the corner of Carluke’s Market Place! “In our day great progress has been made in tempering the mind to truth, as can be discerned amounting to something like a series of revolutions. Much that I dreamt about and even predicted has come. Nature, strictly interpreted, has yielded results and given the finest lessons. To record these in purity is one mission of man, and by doing so the dross of ignorance may be washed away. 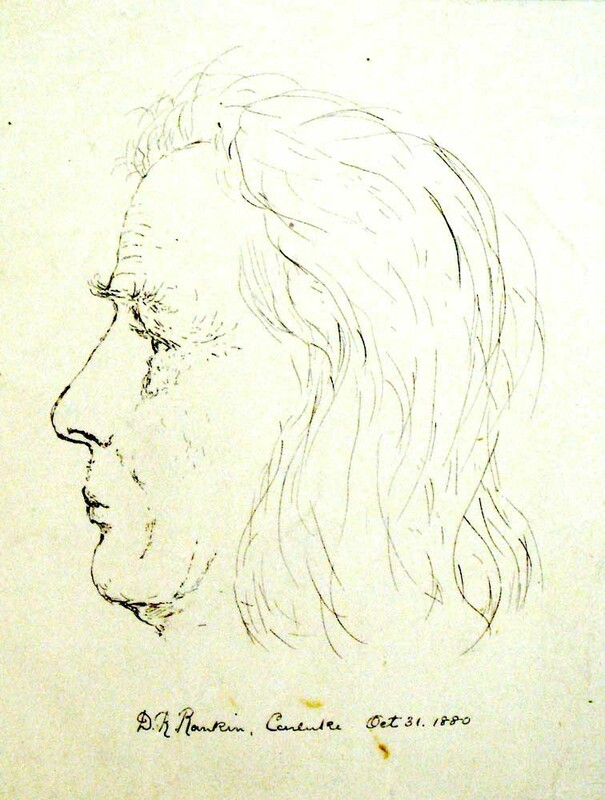 MacCallum-Scott, concluded his chapter on the doctor, by stating that ‘curiously little’ was known of Rankin’s private life, and speculated that perhaps ‘behind the mask he concealed the scars of some bitter tragedy.’ He never married, but his sister, to whom he was much attached, a wee, wizened woman, witch-like in appearance, and eccentric as himself kept house for him. Well on a recent trip to Lanark with my new friend George G. Russell, we discovered an uncatalogued collection of the doctor’s private papers, including certificates, invitations, letters and poems. One poem was written in the doctor’s own hand to Marion – the sweetheart of his youth. Marion was some years younger than the doctor and lived in Edinburgh, coming through to Carluke to stay with relations only in the summer months. The doctor befriended her, taught her to sing, and how to play the flute. In the fields of Orchard, amidst the blossom fragrant, they danced merrily. They took trips to visit Greenshield the sculptor where lovingly Marion sat for her portrait. The doctor was smitten. When Marion returned to Edinburgh he continued to send her gifts, book after book, one taking the form of a little album containing his own poems. I could not live – and part. She is – I know she is – the same. No change will mark her brow. The next summer arrived and with it a note from Marion saying that she might perhaps not get to Carluke. The doctor wrote offering to come to Edinburgh himself and bring her. Neither of the lovers suspected that the clouds were gathering. When the doctor called at the house, mother and daughter were entertaining guests. Marion, hearing the beloved voice, was anxious to rush to meet him, but the mother interposed, and went to meet him alone. What was said no one knows? But suddenly and unexpectedly the doctor found his suit rejected. It would appear that Marion’s mother, having heard of the doctor’s unorthodox views on religion, had hardened her heart. The shock of disappointment, the blow to sensitive pride, cut the doctor to the heart. In his excitement a haemorrhage started and blood all rushed from his mouth. Dr Rankin was not to haemorrhage again – for he loved only Marion. ‘I was through seeing Dr Rankin lately. He lives by himself, although he is poorly sometimes. He saluted me with ‘Danny Longlegs’ and seemed glad to see me. He had to cling to the door-handle for support, and so could not take my hand at first; but as soon as I was in and he had got himself balanced, he said “Where’s your hand now, Dan?” and gave me a kindly shake. His legs are getting weakly now, and he had to cling to the furniture for support as he walked across the house. He stood in the lobby and showed me some specimens. I said that I was afraid I was keeping him too long standing on his feet. He got out with a loud guffaw and laughed, saying that he had given up standing on his head now. Dr Rankin died on Tuesday 21st March 1882 aged 77 years and left an estate worth less than £5. My funeral to be conducted as was that of my sister, perfectly private with no display or ostentation. I wish a plain coffin simply covered with black cloth; no mounting or gilded-gear. No ginger-bread. All parade prevented in every way. All these things I disapprove of. Afterwards let the place of rest of the dead be undisturbed by headstone or monument, the graveyard being distinction enough.